Cleaner hospitals are the public's top priority when it comes to health spending, a survey suggests. The British Medical Association poll - released on the eve of the BMA annual conference - reflects growing concern over superbugs like MRSA, doctors said. The survey asked 2,000 people to rank 10 NHS spending priorities, and having a choice of hospitals - a flagship government initiative - came tenth. The government said tackling MRSA was one of its top priorities. A Department of Health spokesman said a raft of measures had been introduced to improve hygiene and tackle superbugs but that the government believed people did want more choice over their treatment. "In national patient surveys, patients are increasingly positive about the quality of their care, but we recognise that there is more to do to ensure that all patients get fairer, faster and better care," he said. "There is clear evidence that patients want more involvement in decisions made about their care and health. "When we tested this out, the majority of patients offered a choice have taken it." But BMA chairman James Johnson said patients were obviously worried about hospital-acquired infections. 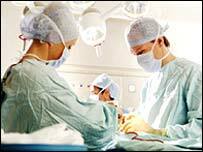 Improved accident and emergency departments was the second most important priority for NHS funds, the BMA survey found. Shorter hospital waits was the next most important. "Quite rightly patients want their hospitals to be clean, they want improved A&E services, shorter waits and increased funding for research and new treatment," he said. "The BMA has been saying for a long time that patients are not so interested in a choice of five hospitals, but they want a good service in a clean, local hospital." Barbara Wood, co-chair of the BMA's patient liaison group, added it was important that the government listened to what patients had to say. Members of the public were asked to give 10 areas of the NHS marks out of 10, to illustrate what they thought was a priority. Cleaner hospitals scored 9.23 on average, while improved A&E got 8.52 and hospital waits 8.42. The ability to choose where to have an operation scored 6.43, behind better hospital food on 6.51. At the end of the year, patients will be able to choose from up to five hospitals or other healthcare providers for their treatment. Last week the Public Accounts Committee warned there was a "fog of ignorance" within the NHS about hospital-acquired infection. They called for mandatory surveillance of all hospital bugs. Only MRSA rates are published at the moment. The number of cases of several other infections are also being monitored, but have not been published yet. The BMA's conference runs from Monday until Thursday. Health Secretary Patricia Hewitt is due to give a speech on Tuesday.